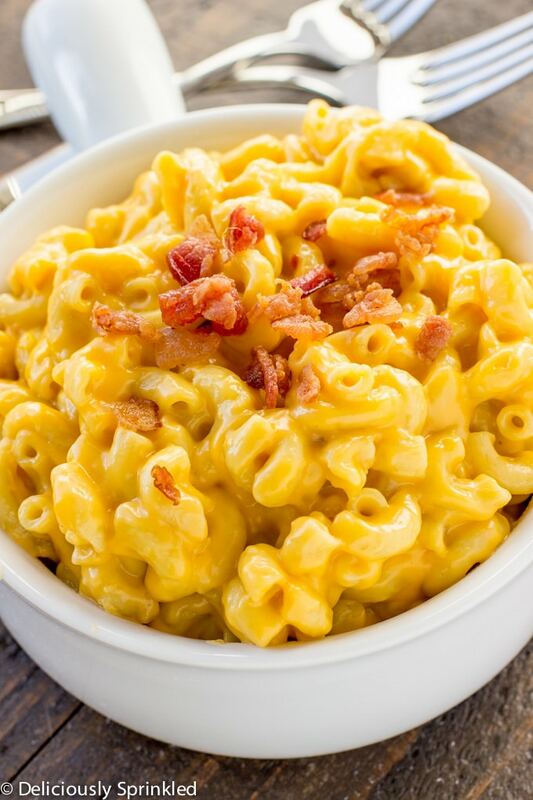 If you love good ol’ comfort food, you won’t want to miss out on this Instant Pot Mac & Cheese! I may have found the best way ever to eat Macaroni & Cheese. My entire life I’ve cooked it a million different ways, but this recipe opened up my eyes to the most perfect and simple option there is. 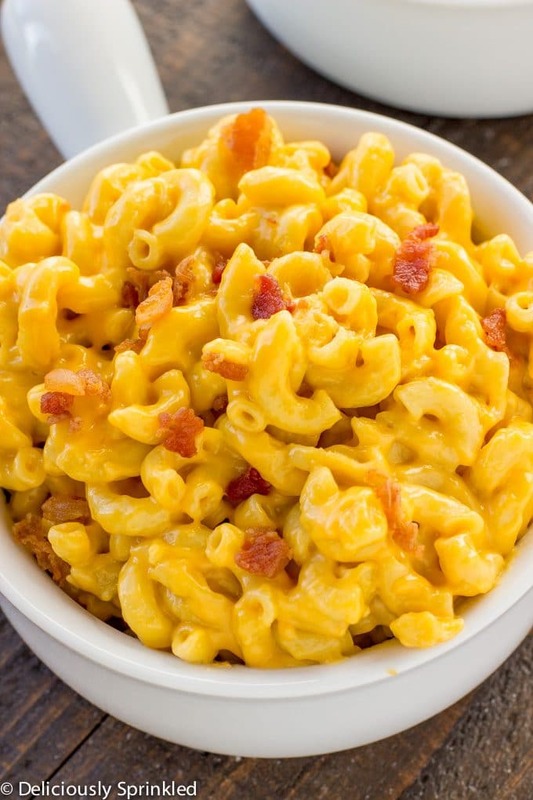 If you own an Instant Pot, then you need to…no, you HAVE to make this Instant Pot Mac & Cheese. 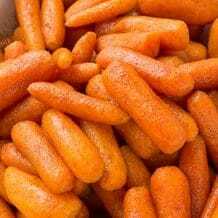 You can make a large batch and even share some with your family and friends if want! Or, you can keep some for leftovers because it tastes just as delicious the next day as well! 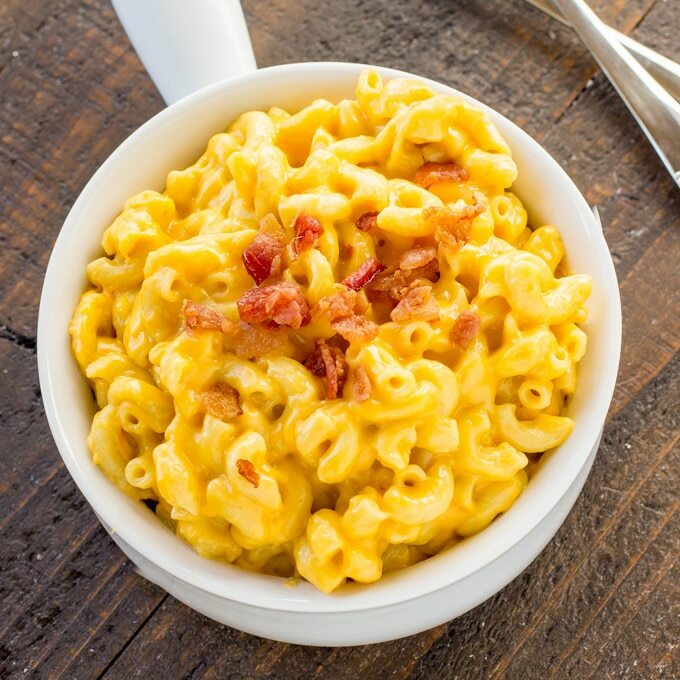 Give your tummy and taste buds and treat and serve up a bowl of this Instant Pot Mac & Cheese! ● 1 BOX ELBOW NOODLES: 1 (16 oz.) box of elbow noodles. ●EVAPORATED MILK: 1 (12 oz.) can evaporated milk. ● CREAM CHEESE: just 2 ounces of cream cheese. ● BUTTER: 3 Tablespoons of unsalted butter. 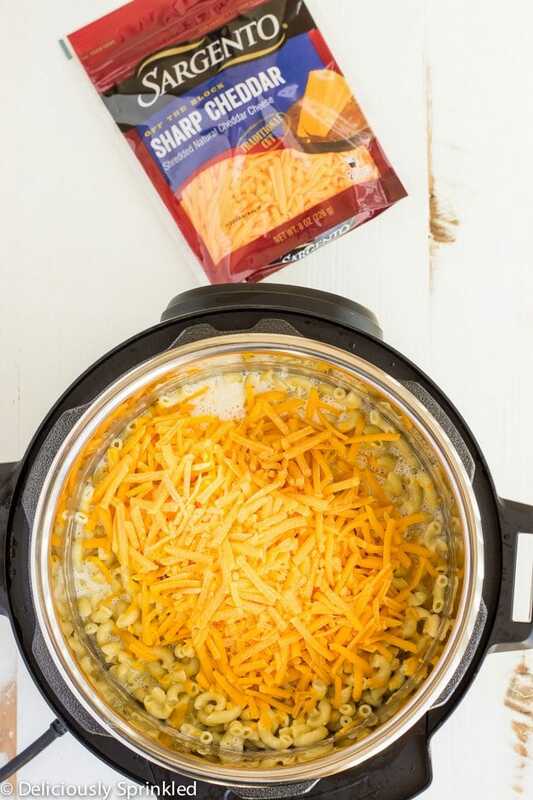 ●SHREDDED SHARP CHEDDAR CHEESE: 4 cups of shredded cheese, freshly grated is the BEST! ● GRATED PARMESAN CHEESE: 1/4 cup of parmesan cheese, again freshly grated is the best to use. STEP 1: Put the noodles, water, and salt in the Instant Pot. STEP 2: Cover the pot and make sure the vent on the top of the cover is set to “Sealing”. STEP 3: Press the “Pressure Cook” or “Manual” button. Set timer to 3 minutes. STEP 4: Once the noodles are done cooking, switch the vent to “Venting” and do a quick pressure release, turn Instant Pot off. STEP5: Carefully open the lid. Press the “Saute” button and then add the evaporated milk, butter, and cream cheese. Mix until butter and cream cheese is melted. STEP 6: Turn off Instant Pot. Add shredded cheese and parmesan cheese, mix until cheese is melted. STEP 7: Add bacon pieces and serve immediately. STEP 1: Follow package instructions for preparing the macaroni noodles, but cook the noodles only half the amount of time as it calls for on the package instructions ( ex. the package says 10 minutes, only cook for 5 minutes). Drain. Pour macaroni into slow cooker. STEP 2: Add evaporated milk, butter, cream cheese, shredded sharp cheddar cheese, and parmesan cheese. Stir together well. STEP 3: Cover and cook on high for 3 hours, stirring occasionally. Serve with bacon pieces. NOODLES: I used regular elbow noodles but you could use small shell noodles, spirals or even penne noodles. 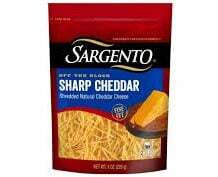 CHEESE: I used Sargento Off The Block Sharp Cheddar Cheese because I’m lazy and I don’t want to shred my own cheese. If you buy “regular” shredded cheese I found that it does not melt very easily because of a chemical they add to the shredded cheese to make it last longer (or that is what I was told!). But for the BEST RESULTS…buy block cheese and grate it yourself. You can find freshly grated parmesan cheese at your local grocery store, as well. LEFTOVER’S: You probably won’t have any leftover’s because this macaroni and cheese is so good but if you do it heats up perfectly in the microwave. If you want it more creamy just add a little bit of milk to it before you put it in the microwave. 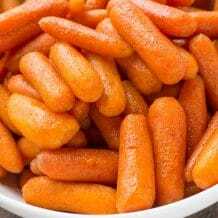 MY FAVORITE INSTANT POT: I have this Instant Pot, it’s a 6 quart and perfect for my husband and I. If you have a bigger family or your always hosting parties, I would HIGHLY recommend getting the 8 quart Instant Pot. 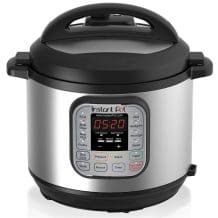 You can also make more things in the 8 quart like a whole chicken, whole turkey, cheesecake, brownies…I have the 8 quart Instant Pot on my Christmas wishlist. INSTANT POT NON-STICK COOKING POT: I also, recommend getting the Instant Pot Non-Stick Cooking Pot…I just got mine in the mail and it makes a HUGE difference because things don’t “stick/burn” to the bottom of the pot anymore. 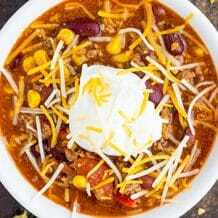 MY FAVORITE SLOW COOKER: I love this slow cooker, it’s the perfect size for every recipe you will make! 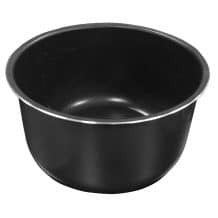 BOWLS: These are my favorite bowls, we use them for everything. Put the noodles, water and salt in the Instant Pot. Press the "Pressure Cook" or "Manual" button. Set timer to 3 minutes. Once the noodles are done cooking, switch the vent to "Venting" and do a quick pressure release, turn Instant Pot off. Carefully open the lid. Press the "Saute" button and then add the evaporated milk, butter and cream cheese. Mix until butter and cream cheese is melted. Turn off Instant Pot. Add shredded cheese and parmesan cheese, mix until cheese is melted. Add bacon pieces and serve immediately. Follow package instructions for preparing the macaroni noodles, but cook the noodles only half the amount of time as it calls for on the package instructions ( ex. If the package says cook for 10 minutes, only cook for 5 minutes). Drain. Pour macaroni into slow cooker. Add evaporated milk, butter, cream cheese, shredded sharp cheddar cheese and parmesan cheese. Stir together well. Cover and cook on high for 3 hours, stirring occasionally. 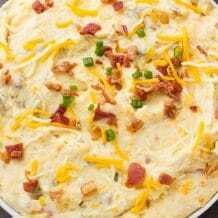 Serve with bacon pieces. I made this for supper Saturday and it was so good! Thanks for a great recipe! It’s high time I joined the instant pot gang. Your mac and cheese looks so yummy I could eat it off my screen. Great recipe!! So cheesy and creamy! 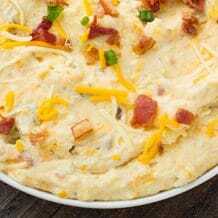 Definitely a great weeknight recipe! This is my ultimate comfort food! 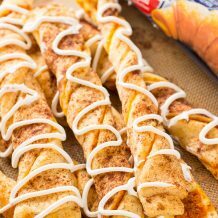 I need to make this ASAP! The best macaroni and cheese recipe I have found! I can’t wait to try this one out in my new InstaPot! Pressure cooker makes every meal so much easier! I didn’t have mac’n’cheese for a long time, so I need to check your recipe later. This macaroni looks so creamy & cheesy!! 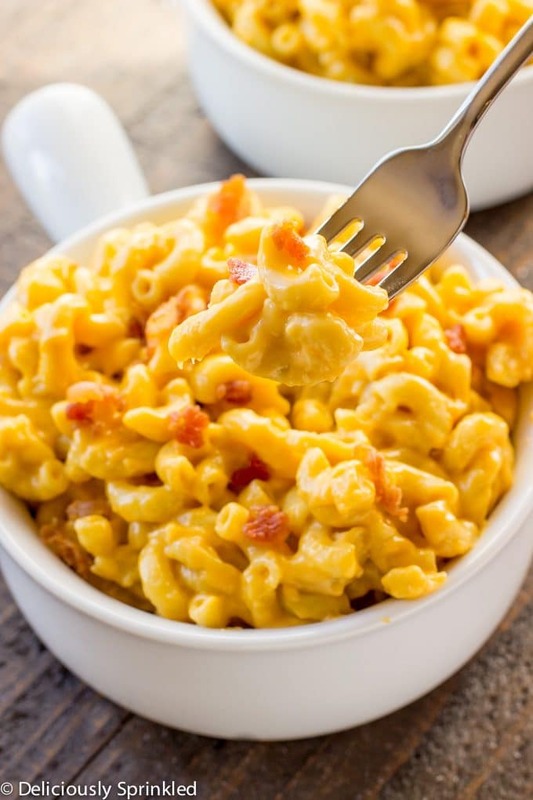 My kids love macaroni, so I can’t wait to make this for them! 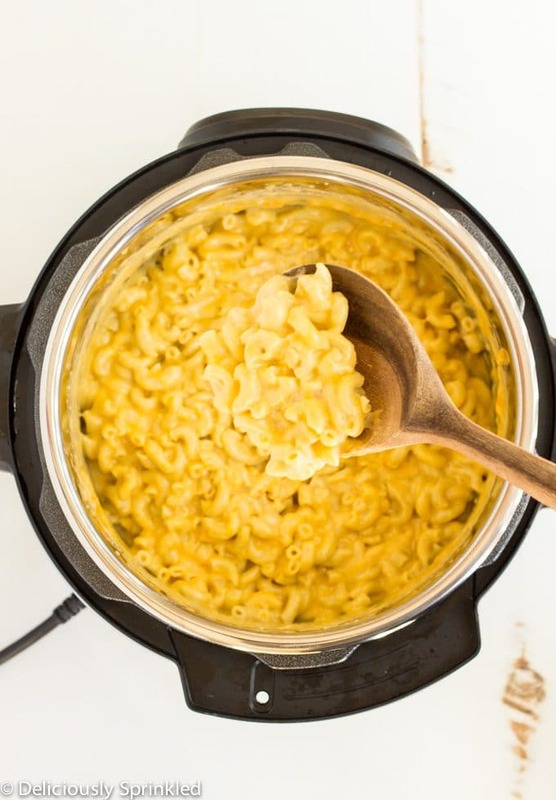 Love using an Instant Pot and even better when its got mac n cheese cooking in it! Total comfort food! So cheesy and delicious! 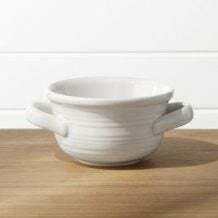 Craving a bowl right now! This would be the perfect comfort food for me. Love that it is cooked in the instant pot. You dont need to drain anything after the noodles are done cooking? Would you be able to make this in a normal slow cooker as well? When you say box of noodles? What size box?